You know that awkward moment when you're wanting a fresh pull from your hookah, but if you take your hand off your controller you'll get sniped by your screen jacking friend? This is a problem of the past my friends! 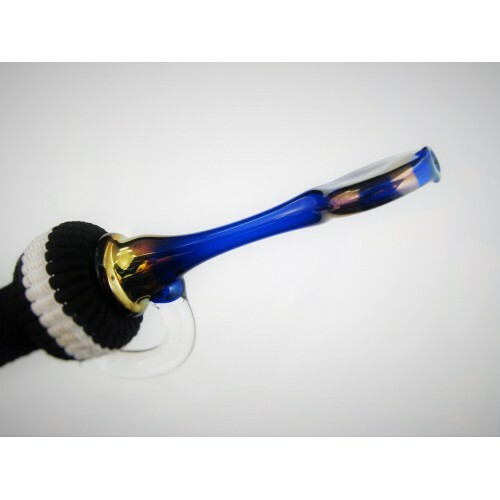 This mouth piece has a thick glass clip built to the frame, designed to hook on to your shirt, and keep your hose within a few inches of your mouth. Protective travel / storage cases now available!! >> www.CrownHookahs.com - Protective Cases. Take 20% OFF any case with any order! Use code "BAGITUP"
Notes: This glass mouth piece was designed in 2010, shortly after one of our regular customers gave us the idea. The process was expedited when I was playing Skyrim, and realized just how valuable it would be to smoke while I was building my smithing skill up. Efficiency at it's finest! Thanks to Mr. Clayton for the idea.